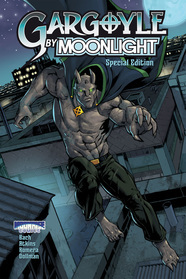 Gargoyle By Moonlight: Special Edition features the all-new Gargoyle short, "Gargoyles Don't Cry." A seedy dealmaker promises to free the Gargoyle from his nightly curse. All our hero has to do is deliver a bag. Too easy? Yeah, that's what he thinks too. Find out what happens when Gargoyle By Moonlight tangles with supernatural gangs and the all-new creepy-crawly overlord of the underworld. Don't miss this fun yet poignant turning point, as Gargoyle battles the evil forces of the city while trying to maintain/regain his humanity and save one very special prize. Timothy Bach, writer; Brian Atkins, pencils; Juan Romera, color art; E.T. Dollman, letters. Digital version available at ComiXology. Print copies will be available on Free Comic Book Day.